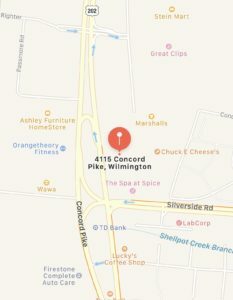 We are located in the Talleyville Center, on the northeast corner of Route 202 (Concord Pike) and Silverside Road in Wilmington Delaware, between the Exxon station and the old Wendy’s. From the south: Take I-95 or Route 141 north to Route 202. Go north on 202 (left turn from 141) 1.7 miles past the 202/141 intersection. The Dojo door is in between California Sun Tanning Salon and Good Stuff. We are on the second floor of the building in Suite B. From southern Pennsylvania via Route 202: About 2 miles south of the border, just past where 202 divides; the next stoplight is Silverside road. Go left, turn onto 202 northbound, and enter the parking lot on your right. The Dojo door is in between California Sun Tanning Salon and Good Stuff. We are on the second floor of the building in Suite B. From the north via I-95: Exit the interstate at the US-202/Concord Pike North exit. The Dojo door is in between California Sun Tanning Salon and Good Stuff. We are on the second floor of the building in Suite B. 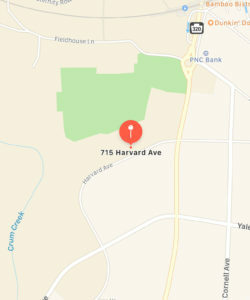 The Dojo is located in the Swarthmore Community Center, on the northwest corner of Harvard Avenue and Chester Road in Swarthmore, PA. It is near the junction of I-95 and I-476. From Philadelphia or Wilmington: Take I-95 to I-476 (the Blue Route). Go north on I-476 and take the first exit, East on McDade Blvd. Take a left at the first light, which is Fairview Road. Go 1.1 miles on Fairview to S. Chester Rd and turn right. After a half mile, turn left at Harvard Avenue; the Community Center is on the right. From the Blue Route: Take I-476 south to Baltimore Pike (Rt.1). Take a left and go 1.7 miles to Route 320. Turn right and follow Rt 320 for 1 mile to Harvard Avenue. Turn right at Harvard Avenue; the Community Center is on the right.